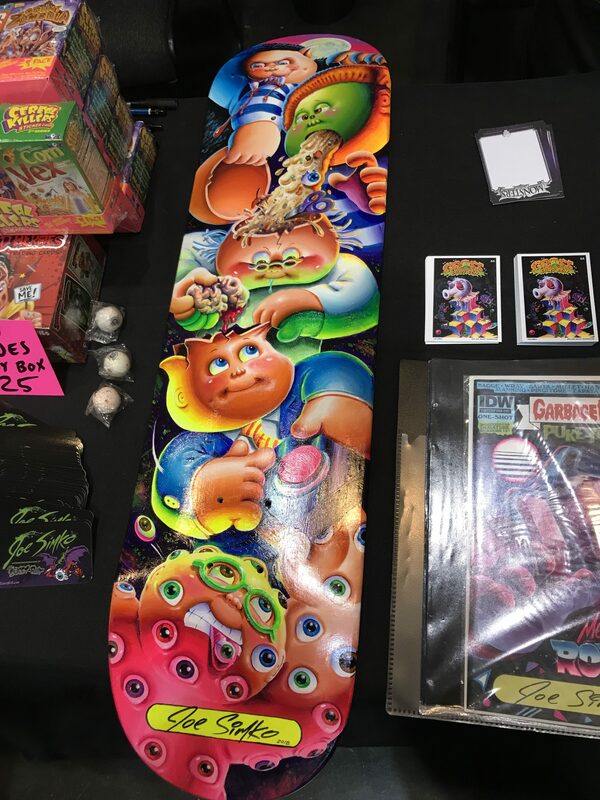 Overlooking California’s Great America theme park and Levi Stadium, home of the NFL’s San Francisco 49ers, Garbage Pail Kids artists and collectors from around the country gathered for the latest Gross Card Con. This past weekend was the third Gross Card Con event, this time held at the ToyXpo in Santa Clara, California. This event was smaller in nature compared to previous events in Las Vegas. There were both less artists in attendance and less events planned. However, collectors that did attend had fun spending time with the artists. 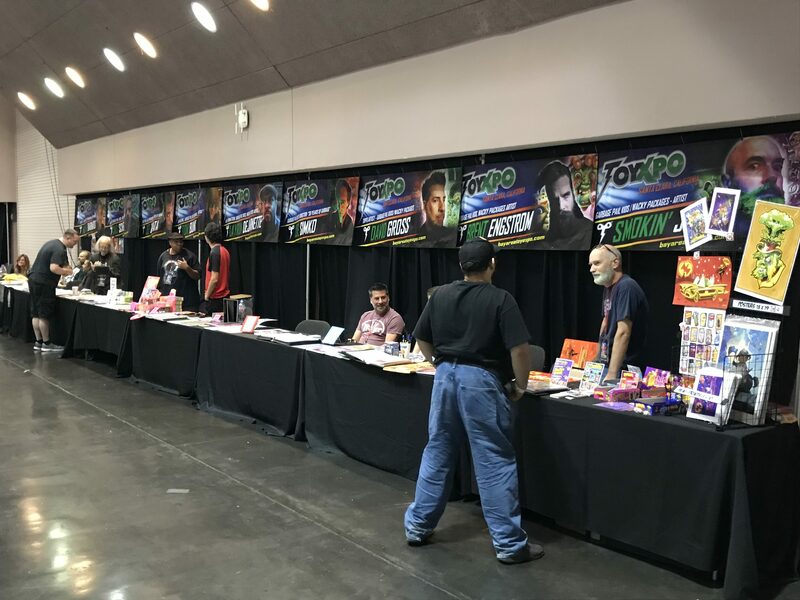 Excitement is building as artists and attendees are getting ready for the next Gross Card Con event at the ToyXpo show in Santa Clara. After two successful Gross Card Con (GCC) events the last few years, organizers of the Las Vegas Toy Con have decided to expand the GCC concept. Much like the Vegas Toy Con, the ToyXpo caters mainly to toy and pop culture fans. GCC will once again be an event inside the ToyXpo. 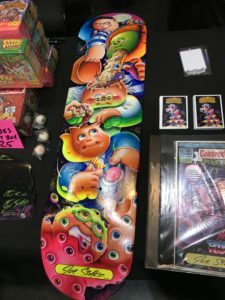 While the GCC won’t be as large as the Vegas show or have as many GPK specific events, your favorite GPK artists will be on hand offering their great art. The show is scheduled to take place Aug 24-26 at the Santa Clara Convention Center. The show will be open Friday 1:00-9:00, Saturday 10:00 – 8:00, and Sunday 10:00 – 4:00. Show organizers are planning two GPK events that show goers won’t want to miss. Friday at 6:00 PM in the Great America Ball Room K will be the Q & A artist panel. 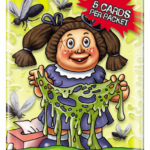 Many of the artists will be on hand to answer all the GPK fan’s questions. Also Saturday night at 8:00 PM in the Convention Center Theater will be a special screening of 30 Years of Garbage movie. All show ticket holders are invited to attend to see a private showing of the excellent GPK documentary that was released in 2016. 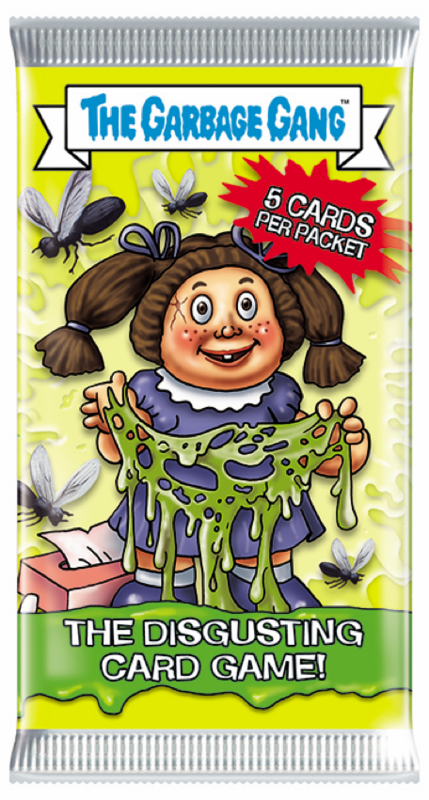 If you haven’t seen the move yet, or want to relive it with a bunch of GPK fans, now in your chance! 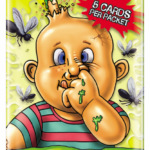 Details around a new UK Garbage Pail Kids release started to come out earlier this week from Topps Europe. After sharing images of the pack wrappers all this week, the sell sheet is now out. Today Topps Europe officially announced The Garbage Gang. 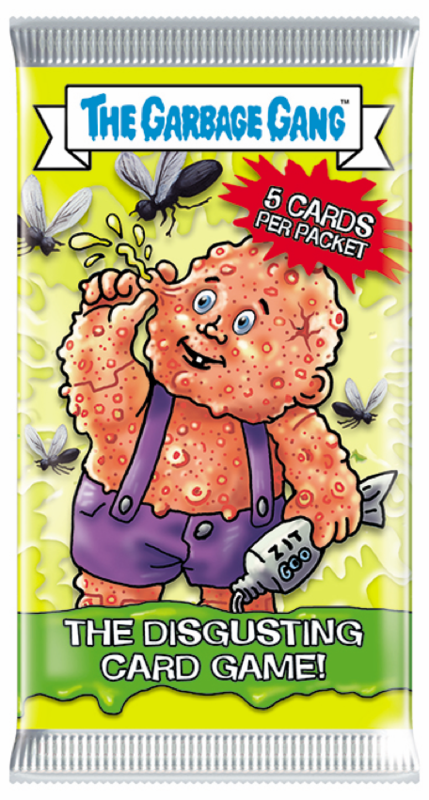 The packs and boxes also include the tagline, “The Most Disgusting Trading Card Game”. As many eagle eyed collectors already deducted, the set appears to be a reprint of the Kakkones release in Italy from 2008. Just like the Kakkones release, the set contains 96 base cards. The base cards all have a green border. The cards pictured on the sell sheet appear to match up with cards from the original Italian set. The artwork features mostly cards from ANS 1 & 2. There are no a/b versions of each card. Rather just one name is used. 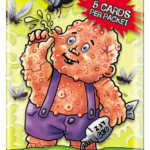 Also, unlike most GPK sets, these are not stickers, but rather game cards. The backs of the cards have stats and other information used to play a battle type of game. There will also be 10 Lenticular cards randomly inserted into packs. Those will have a blue border. That’s it, no parallels, no sketches, just an old school ANS type of configuration. There will be two different configurations available. Each pack will contains 5 cards, with the possibility of pulling a Lenticular card. A retail box contains 24 packs, while a case contains 12 boxes. Each pack carries a retail price of £1.00 (British Pound) or €1.60 (Euros), (roughly $1.30 in US dollars). There will also be a blister pack, called a “Starter Pack”, that contains 1 pack of cards and a mini collector binder. The packaging also suggests there will be a special lenticular card included. Each Starter Pack comes with a retail price of £3.00 (British Pounds) or €4.80 (Euros), (roughly $3.90 in US dollars). Topps Europe will work with GPKNews as the release gets closer to offer a contest, so stayed tuned! A copy of the sell sheet as a PDF is available here, or you can check out the picture below. The Garbage Gang will be available across the UK on Sept. 27, 2018. Update 8/1/18: Topps Europe shared an additional pack image with GPKNews. However no other info about the set is available. Stay tuned to GPKNews for additional details when they become available. The last time the UK saw a release of Garbage Pail Kids was 2004. It appears that’s about to change. 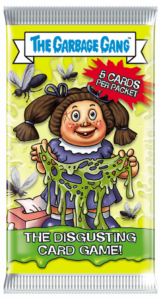 As first reported by GPK collector Rodiguns Fell, Topps Europe has confirmed with GPKNews that they are planning an upcoming release of The Garbage Gang. Details of the upcoming set are scarce at the moment. Topps Europe supplied us with a mockup for one of the pack wrappers. 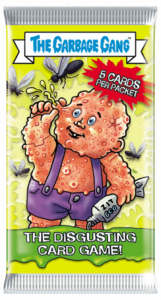 The wrapper features the ANS artwork of Explorin Norman, which was featured on both the US ANS 1 packs and the 2004 UK GPK release. 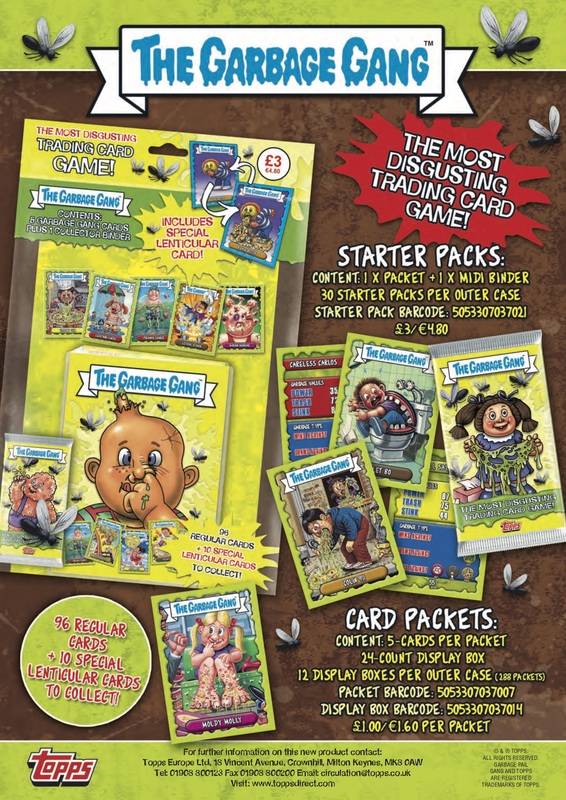 The top of the pack has a blue “The Garbage Gang” banner, along with advertising the pack contains 5 cards. What is really interesting is the tag at the bottom of the pack which says, “The Disgusting Card Game”. This of course leads to a ton of questions, none of which there are answers for yet. Rodi spoke to a Topps representative this past weekend at the London Film & Comic Con. The Topps rep shared with Rodi that the set would be released this October. 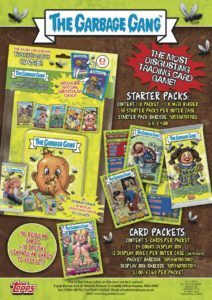 They said the cards would be a reissue of the 1991/92 Garbage Gang UK release. He also mentioned the cards would have a yellow border. Right now those are the only details available on the set. Topps Europe is a subsidiary of Topps in the US. The company was originality Merlin, until it was acquired by Topps in the mid 1990’s. The company is the distributing arm for Topps products in Europe. On their website they sell mainly soccer, Star Wars, WWE, and kids sticker sets. 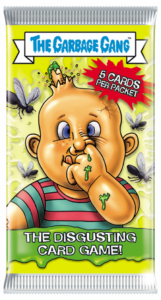 Both the 2018S1 and 2017S2 GPK sets were offered in small quantities to collectors in Europe directly from them, the first time GPK cards were available directly in Europe in over a decade. GPKNews will keep collectors up to date, once additional details on the set are available.